September 2017 – Teach. Brian. Teach. With slinkies, it definitely pays off to take the time to teach students how to make (then practice) making good “pulses” of varying amplitude and width. 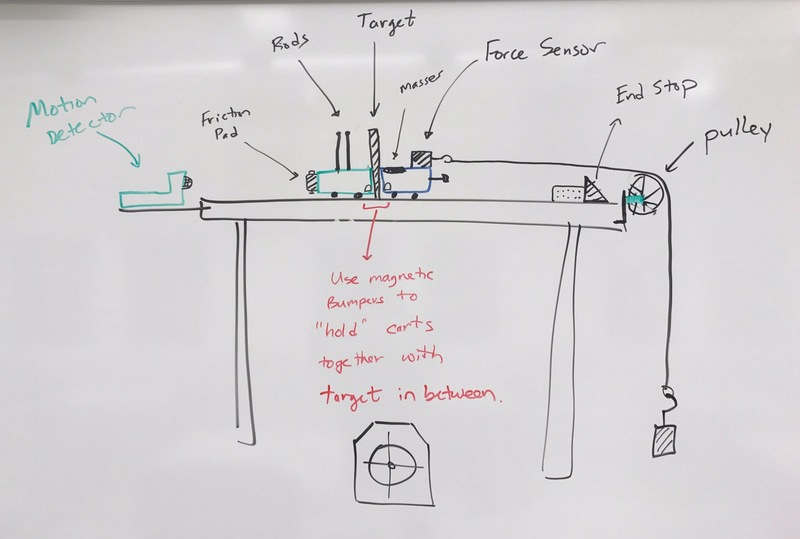 Students who have a good sense of how to control wave pulses and trains are positioned to do better explorations. 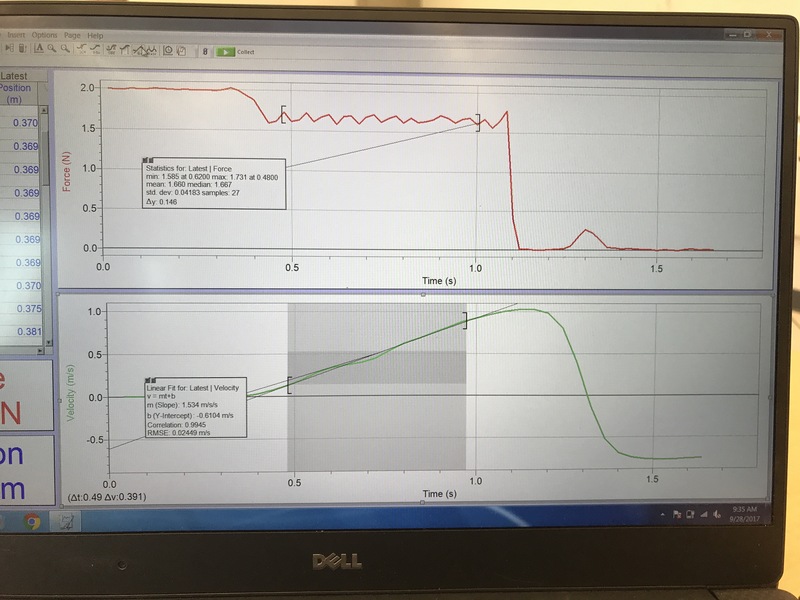 Last week I taught them how to make good pulses and they practiced, before going in to investigate the factors that do and don’t effect wave speed. This led us back to slinkies to investigate superposition. Students made slow motion videos of wave pulse chicken. I wish I had all videos students made. They were awesome, and traversed a vast swath of scientific and aesthetic territory. We shared our videos under the document camera, and talked about what we noticed and were wondering about. A brief lecture on superposition and a simulation preceded some clicker questions to practice. First clicker question was an easier superposition one could do in your head. Everyone got it correct. The second one was a long title bit harder to do in head, and so with discussion I modeled how to diagram it carefully. The third question was much harder, and I told students ahead of time that we would first try to do it in our heads, and then go to whiteboards. Our first vote was all over the place, but students worked hard at their whiteboards and all reached same answer. Several students talked about it being fun to figure out how the waves superpose. So We add to our wave model the idea of superposition as a way to deal with multiple sources, and I pivoted to the issue of finite media with boundaries. Students were sent back to explore what happens when a pulse reaches the end of the line. Students observed the important features, and their was a very brief lecture on reflections. We’ve been going back and forth between waves on strings and sound, so we pivoted to talk about sound wave reflections (echoes) and how to make a good sound pulse by snapping fingers. We practiced making good sound pulses and examined their pulse shapes with microphones. We then observed reflections (echoes) ny snapping at one end of PVC tube closed off at other end with a whiteboard. This exploration allowed us to see echoes , and culminated in us calculating the speed at which the sound pulses traversed the tube. We got decent data, all between 320 and 350 m/s. Then we took a break. Back from Break, students were sent off to play “pulse chicken” with reflected waves–and to figure out how to constructively and destructively interfere with it. Students had fun with this, and had gotten really good at creating pulses that would cancel out. This “naturally” led us to standing waves, which I motivated in part by switching from sending wave pulses to sinusoidal waves. We explored a simulation to look at how traveling sinusoidal waves superpose to create a “standing wave effect”. Students were tasked with trying to make standing waves with slinkies. Students struggled with it, which was good. They struggled exactly because only certain frequencies work. For many groups, I eventually modeled how to make a standing wave, but I always did it with my eyes closed. The trick of keeping your eyes closed helps them notice that it’s about “feeling” the right timing. Only the right timings will create standing waves. Students were then successful at making standing waves of their own. We summarized our findings and introduced the modal naming conventions. We practiced with clicker questions, naming and identifying wavelength of various standing waves. Then students were tasked with drawing first six modes on a string of 120 cm length. They had to determine wavelength of each, and then without drawing see if they could determine higher order modes as well. Students were then pressed to invent an equation. Most students invented wavelength = 2L/mode, or wavelength = L / (m/2). Mostly while circulating I helped connect rewrite this as m * half wavelength = L. Each picture shows either 1, 2, 3, or 4 … half wavelengths fitting inside L. Mode number tells us how many halfwavelengths are needed to span the length. The day ended by looking a guitar string by oscillating in slow motion, and under different harmonics. The final teaser was to look at the frequency spectrum for gently tapped tuning fork vs a harshly plucked guitar string. Next week, we return to problem solving with standing waves. I’ve been doing a fair amount of matxhimg tasks in physics I . Here are some examples. In second semester physics, we spent first two weeks on oscillations. We first explored and played with variety of springs and talked about what we noticed. Students noticed varying lengths, coil thicknesses, and diameters. They noticed different materials, that some only stretch, while others stretch and compress, that they have different stiffnesses, that some have “hoops” or “hooks” at their end. We also talked about what other things in this world are described as “springy” but not really springs. Diving boards, skin, trampolines, exercise bands, bouncy balls, etc. I reminded students that last semester we saw that lots of surfaces are springy, but often very stiff (normal forces). Started with a mix of prediction and observation tasks with motion detectors of a vertical oscillator. Lots of position, velocity, and acceleration. I have a diverse group in terms of familiarly with kinemarics graphs, and facility distinguishing velocity and acceleration. Next time I would start with more review of free fall and looking at graphs, or see my note below about bungees. Some direct instruction and practice with sinusoidal functions, as well as amplitude, period, frequency, including clicker questions and ranking tasks. That amplitude doesn’t effect period is a culminating finding. This day ended with problems that helped students connect graphs to equations and physical meaning. 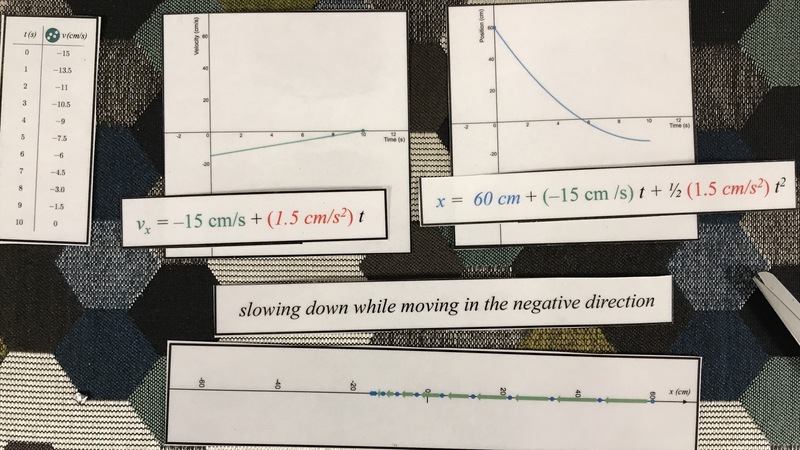 Next year we definitely need to have students play around with feeling of being yanked back and forth by a bungee, before jumping into graphs. We explored meter sticks wobbling, and how stiffness and mass effect frequency. 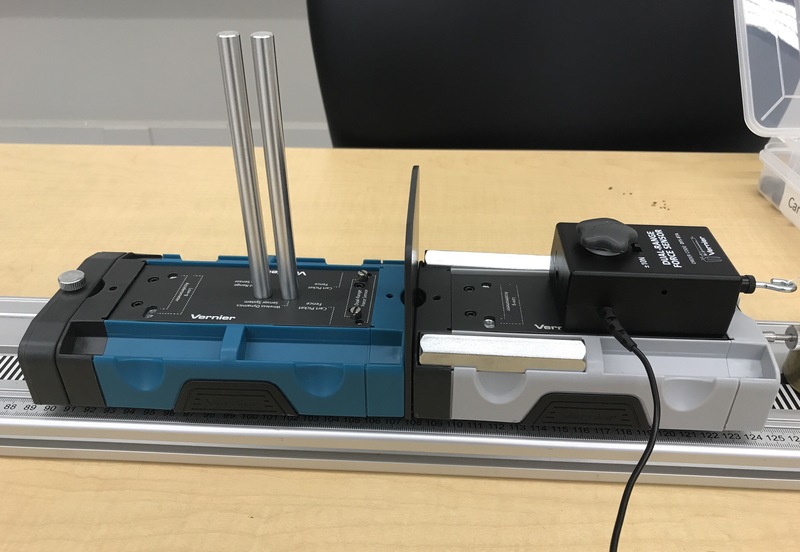 Students are asked to make claims and support with evidence, but also to try to connect to everyday experience… a lot of this is fun, students connect to music, other students connect to Newtons 2nd law. We had fun making slow motion vids. We go back to springs and I model how to use logger Pro to get period/frequency two ways… Data marking and curve fitting. We all do same data point, 200 g on a 15 N/m spring. We plot that point on graph at front o Room and then students are tasked with getting data for other masses. Before collecting students must predict where their next point might be and to support claim by referencing what we leaned earlier in the day. We build our data and model together and then I did some brief direct instruction, which was followed by clicker questions, ranking tasks, and one brief numerical exercise. We did some review about what we’ve learned about SHM, so far. Worked the beginning of a problem we would later tackle with energy. Students were given mass, spring constant, and amplitude, and asked to graph position vs time and force va time, with extrema and period labeled quantitatively. We then did some “review” of energy. This led us into working a 1st semester problem of child going down a slide. Students then observed pendulum swing and phet energy skate park– how similar and different than the child on slide? We then looked at oscillators driven by elastic potential energy, rather than gravitational and did clicker questions pertaining to where maximum / min KE and PE occur. And also some questions about how we can get more total energy in a system. 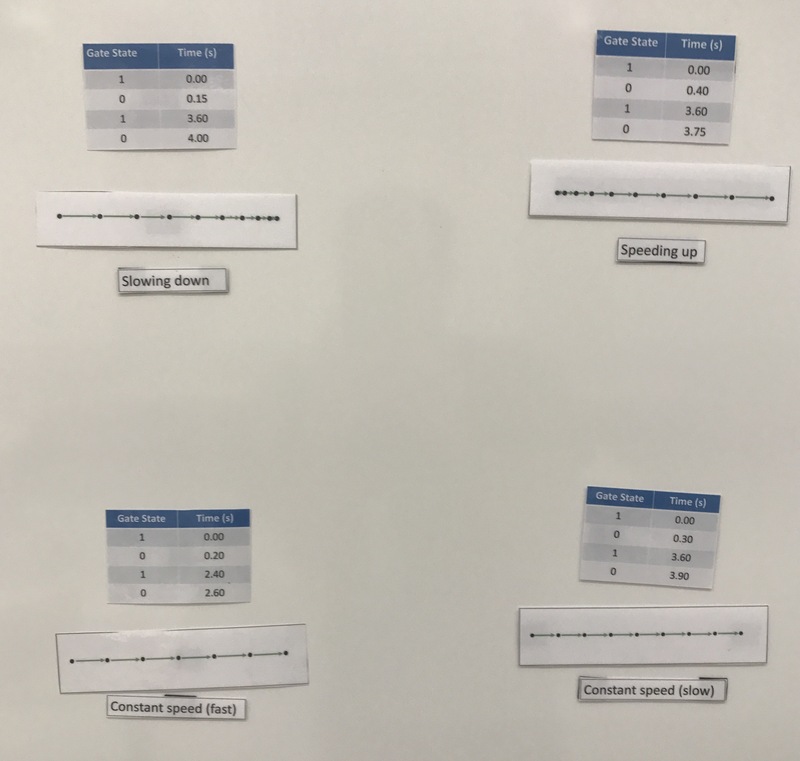 Students went back to problem of the beginning of day to tackle from an energy perspective… finding total energy, maximum speed, and speed and half amplitude. 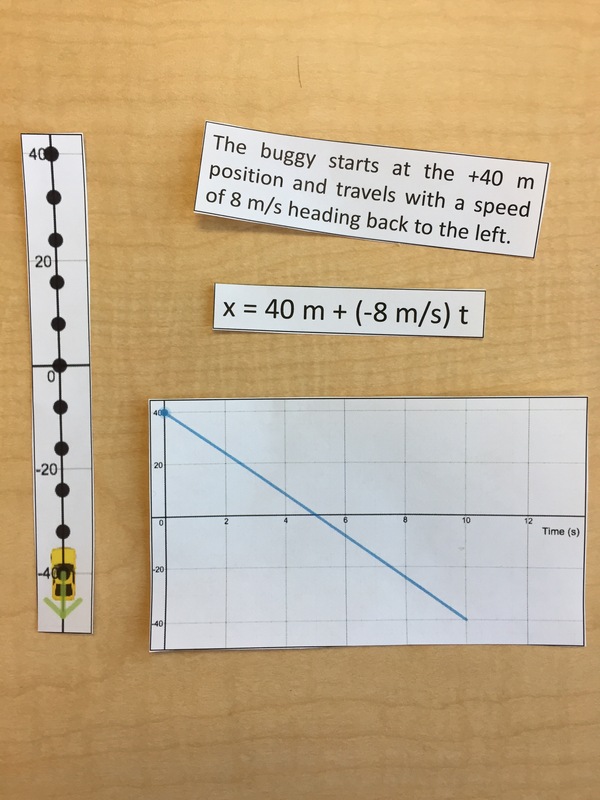 Students were asked to add velocity vs time graph and an energy vs time graph. Next week we get out microphones and start exploring the oscillating behavior of that data. We’ll start really just playing around,trying to make sounds that do and don’t look like the graphs we’ve seen from SHM. Once we can get some graphs that look good, we use methods from previous week to explore frequency and period. Probably get some tuning forks out, and maybe even try and record our wobbly metersticks experiments. This leads into an introduction to waves as oscillatory energy on the move, and a pivot away from sound and toward waves on slinkies. Students play with slinkies, with some guiding questions to get them to explore how to make tall vs short pulses, and how to make fat vs thin pulses. Some questions get us observing wave speed down the slinky vs transverse motion of coils. This then transitions to looking at phet sim with waves on string. To get us back to the textbook, I introduce and we practice picture graphs (displacment vs position at a particular moment) for history graphs (displacement vs time for a particular location). We’ll do some clicker questions and other various practice with making and interpreting those graphs. ﻿At some point next week we’ll need to wade into factors that effect wave speed, sinusoidal waves, etc. I have needed to remind myself of this several times, but here I am again… Anytime a clicker question tis likely to spur a compensation argument, do not let students volunteer answers to any answer. Because…. If the first student to talk gives the compensation argument, it is overwhelming to understand. Instead, it’s better to ask for one side of the argument, then other side argument, then open it to people who think it will compensate. It’s just too much cognitive load for many students to hear all three arguments straight out the gate.